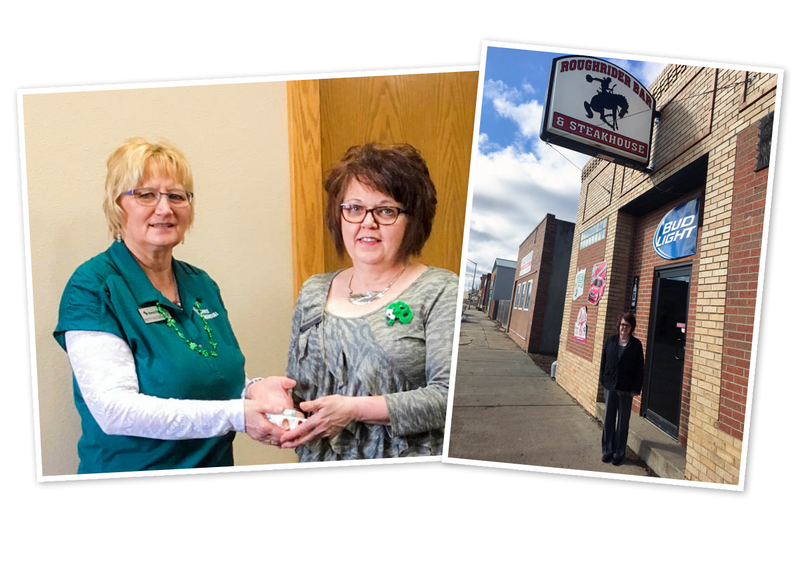 Burly’s Roughrider Bar and Steakhouse in Belfield, North Dakota is a staple for the community. It’s just down the street from Choice Financial, and Internal Audit Specialist, Joyce Reisenauer, and Personal Banker, Diane Tift, stop by occasionally for lunch. Recently, the steakhouse was closed for a short period as the owners transitioned. A young man named Nate was taking over. He opened an account with Choice for the business, and soon he and the team got to know each other. “This is my dream,” he told them. Nate is a chef. But he admitted he had little experience in business operations. As the opening date drew near, the Choice team was keen to help out in any way they could. A few days before opening his new business, another thing was added to Nate’s plate. His wife had a baby! He was now a first-time dad, and opening a full-scale steakhouse and bar. Diane, who had worked closely with Nate in the weeks prior to the opening, knew he had a lot on his mind. The day before the steakhouse was set to open, she racked her brain thinking of any details that could have been overlooked. Suddenly, she realized she hadn’t seen anyone from the steakhouse come in that day to pick up change. She quickly dialed up the steakhouse. No, they did not, they said. In fact they had completely forgotten. Had Diane not called, they would have opened the next day without cash or change available for the customers. Thanks to her call, they had everything they needed for a smooth launch the next day. In the months since, Nate and his steakhouse have continued to thrive. And of course, Diane and Joyce and their co-workers continue to frequent the spot for a delicious meal every now and then. “We’re happy somebody bought it so it could stay open in Belfield!” they said.